It is a publication in particular interesting for choir conductors, composers and researchers. Current full IKS members can buy it for USD 28.00. 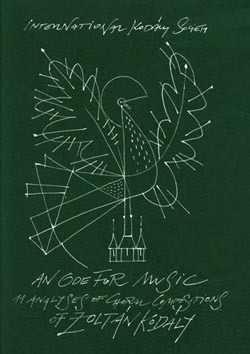 All those who have felt the sense of meaning that comes from collective singing know how much we owe to Kodály's prophetic understanding that the human hunger for community can be uniquely fulfilled through shared music. We are indebted to him as well, for his recognition of the immensely inspiring force that can be found in the ancient melodies of one's own land. A force that arises from the deepest roots of the human mind and heart in all cultures and at all times. The volume is a tribute to the composer's legacy in the field of choral music. It includes contributions from eleven prominent musicians, composers, conductors and musicologists who have dedicated their lives to carrying on Kodály's work. In their writings we may feel the depth of understanding that comes from a lifetime of devotion, as artists and teachers, to the model set by Kodály himself. The performances of the pieces on the CDs are chosen from among the best available. The recording of the Budavári Te Deum is an historic one conducted by Zoltán Kodály himself.